What looked like it might have been a quiet week for the podcast turned out to be a very busy one, as a surprisingly eventful Comic-Con brought big news and reveals for Doctor Who, Star Wars, Harry Potter, and the wildly schizophrenic state of DC’s film and TV slate, ranging from the awesomeness of getting Batman The Animated Series on Blu-ray to the unintentional hilarity of the awful Titans trailer. We cover all of that in more, and also dive into the very complicated news about Disney’s firing of Guardians of the Galaxy director James Gunn. 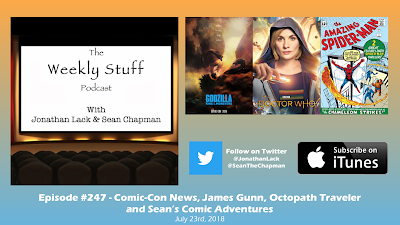 Sean and Jonathan also talk about Sean’s journey through the Mission: Impossible series ahead of next week’s Fallout, Jonathan continues his review of Octopath Traveler, and Sean regales us with tales of his recent adventures trying to read Spider-Man comic books.